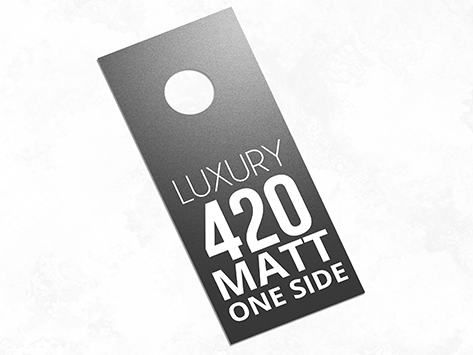 Door hangers premium 420gsm with matt cello one side are more durable and thicker than our 310gsm matt cello one side Door Hangers and is still able to be filled out on the other side. Great for in-room menus or out of service signs. Also known as doorknob menus, these Door Hangers are hung on the door outside guest rooms and can be used in a variety of ways from breakfast menus, do not disturb signs, please make up my room signs, hotel, and motel menus, corporate golf day signs. All of our Door Hangers come with our free die cut.